This recipe is not only a sustaining breakfast but makes a quick and easy light brunch or lunch. You could also serve it with a crispy green salad as an evening meal. Choose a grainy bread, pumpernickel bread, sourdough or a stoneground wholemeal bread to accompany the meal. 1. Whisk together the eggs, milk, pepper, chives and dill in a small bowl. 2. Heat a large non-stick frying pan over medium heat. 3. Add the egg mixture and cook for about 30 seconds, or until the eggs start to set around the edges. Using a wooden spatula, gently fold the eggs over, then repeat the folding process until the eggs are just cooked. The eggs should be quite soft. 4. Gently stir in the salmon and spinach until the salmon is heated through and the spinach is wilted. 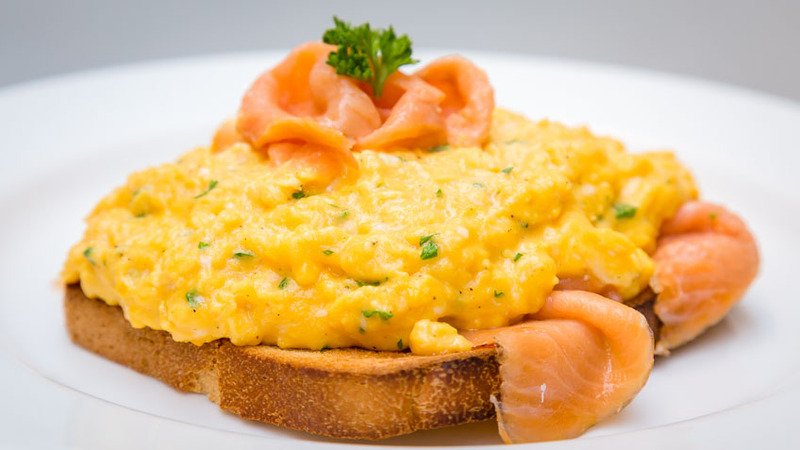 Serve the eggs on toasted grainy bread. One of the most important changes you can make to lower the GI of your diet is to choose a low GI bread. Choose a grainy bread, pumpernickel bread, sourdough or a stoneground wholemeal bread. Recipes and image from The Low GI Cookbook, Hachette Australia.